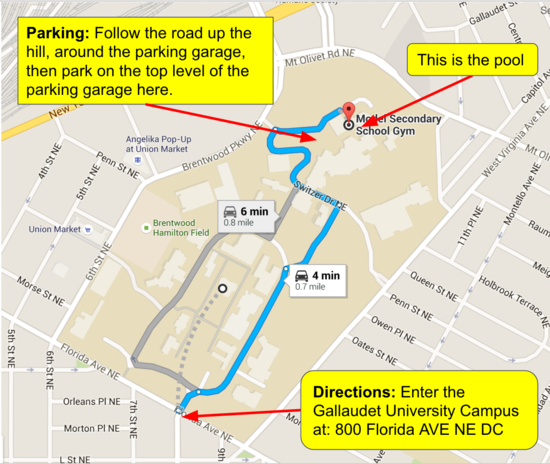 We have two pool locations on the Gallaudet Campus located at 800 Florida Ave NE Washington DC 20002. 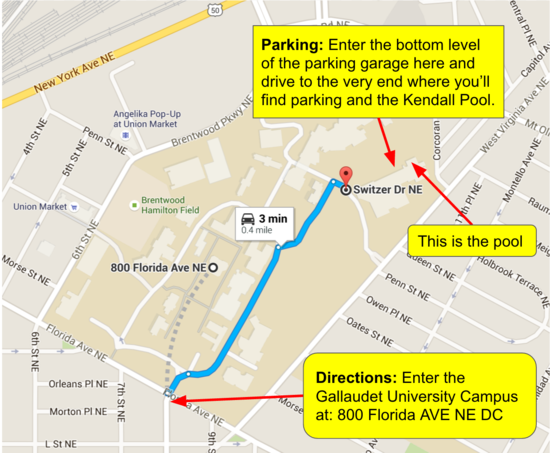 NOTE: Most lessons are at the MSSD pool - only the Parent & Tot Lessons occur at the Kendall Pool. Double check you are going to the correct pool. Turn RIGHT onto Lowman Lane. If you don’t make a right here, you’ll continue to circle around the university all the way back to the security booth. Follow Lowman Lane to the stop sign. The baseball field will be on your right. Turn LEFT and proceed through a tunnel that looks like a central receiving area for trucks. Turn RIGHT at the stop sign and start heading uphill. Follow the road around the outside of the above ground parking structure all the way to the top floor of the parking lot. Park anywhere and walk towards the cul-de-sac and take the sidewalk in between the two buildings. The MSSD Athletic Building doors will be ahead on your left-hand side. Enter through the doors into the lobby and turn right at the Trophy Case. Head down the hallway to the blue double doors. This is the pool! Turn RIGHT at the security booth after entering campus from Florida Avenue NE and continue past Hotchkiss track and field. Make a SOFT right turn from the stop sign and drive into the ground floor of the parking garage slightly off to the right in front of you. If you make a hard right, you’ll drive towards the Elementary School playground. Drive ALL the way to the back of the ground floor of the garage and park where space is available. Enter through the set of glass double doors on the right at the very far end of the garage on the ground floor and make an immediate left once you are inside the school – you’ve now arrived! 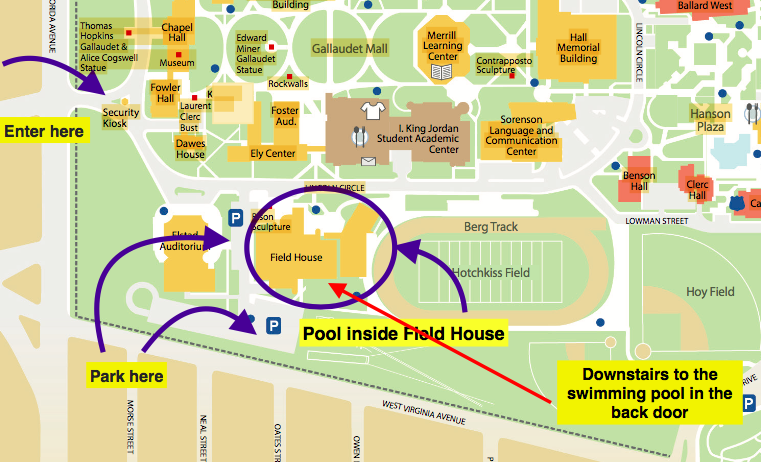 On occasion, lessons may temporarily take place at the University’s Collegiate Pool located in the rear of the University Field House. Make a RIGHT BEFORE the large bison statue which will quickly be on your right. If you pass the athletic field you have gone too far. After turning right, follow the side road ALL THE WAY to the parking lot behind the field house which will be on your left-hand side. You will pass parked cars on the right before getting to the back lot. DON’T PARK THERE. Park on the left as close to the athletic field as possible. Walk towards the Hotchkiss athletic field and the black chain link fence. As you approach Hotchkiss field, you will see large glass windows down a flight of stairs on your left – THIS IS THE POOL! Enter the pool through the glass doors at the bottom of the stairs.